The energy range is designed to be flexible, paying special attention to materials and applications - raw materials, corundum and silicon carbide mixed with resin bonds and special fillers. Reinforced fiberglass meshes are chosen for their quality and strength, resulting in maximum security when using the disc. The Energy Cut Line series offers a full range of sizes and specifications for cutting steel, stainless steel and stone. Discs are used for electric and pneumatic hand-held machines, portable separating machines, angle grinders. One of the main features of the Energy Cut product is the cool cut that prevents the thermal deformation of the treated surface. The Mabtools Energy range includes cutting and grinding wheels designed to work on steel, stainless steel, iron, stone and concrete. 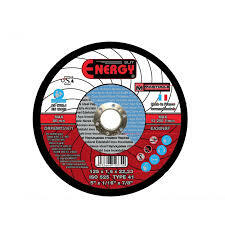 The Energy line is designed for professional use, portable angle grinders, electric and pneumatic hand machines. The Enerdy line is characterized by clear, precise and colorless cutting and excellent ease.